We tend to believe in things most people believe in, cause it gives us a sense of reassurance that something is good. When in doubt about what to order in a restaurant we ask the waiter–“What would you recommend?” or “What’s your best seller?”, assuming that it is the best choice if the majority would go for that. It also works the other way around–when we hear that salesman saying “This is our best seller this season” it affects our buying decision. Additionally, we have all seen the “trending” or “most popular” tags and stickers e-shops put on their items. And this probably holds true for videos as well. In light of this philosophy, these are the 3 most-watched TED talks of 2018 in Business according to the TED audience. 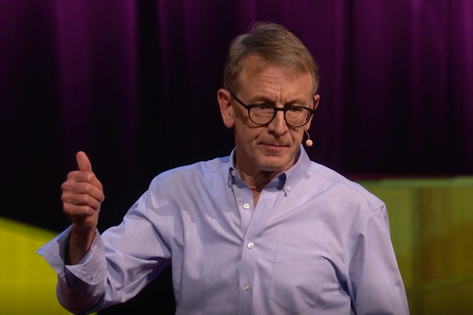 John Doerr is the author of the New York Best Seller “Measure What Matters: How Google, Bono, and the Gates Foundation Rock the World with OKRs”. In his Ted talk, he explains the power of Objective and Key Results (OKRs), a goal system used by Google and many other organizations. John introduced the tool to Lary Page and Sergej Brin in 1999, they have adopted it and use it since then–Lary Page explains in the foreword of the book. The objectives are what you want to accomplish (the direction) and the results are how are you going to do that. However, he emphasizes that importance of setting the right goals that should be purpose driven. And that is where the famous question “Why?” comes in. John Doerr says it is crucial to measure what really matters and that the OKRs can be used by organizations, teams and even individuals. Frances Frei, a Harward Business School Professor delivers an authentic talk about what happens when trust is broken sharing her experience during her work at Uber. Authenticity is simply being you, as people can sniff in a moment if someone is not being their authentic true self. Logic includes the quality of our logic and our ability to communicate our logic. Empathy is the most common wobble as we are all self-distracted, but without revealing empathy everything is harder. Listening, being present and putting away our biggest distraction magnet–the smartphone, are only a few of the things that can help in demonstrating empathy. If we sense that someone is being authentic we are more likely to trust that person. If we sense that the person has a real rigor in his logic we are more likely to trust him/her. And if we believe that that person’s empathy is directed towards us we are far more likely to trust him/her. The Internet has changed our lives forever, and now the new wave of even greater change is brought by the IoT powering the Forth Industrial Revolution. This TED talk aims to increase the awareness about how companies collect and use our data and send a message that companies should rethink the design of their devices taking into account their user’s privacy. Smart locks, smart toilets, smart lights, smart beds are only a few of the smart devices companies are offering us. Each device is connected to the internet, gathers data and talks to its owner. Kashmir Hill and Surya Mattu who both work at Gizmodo wanted to find out who else can these devices be talking to so they made an experiment and in their talk, they share their findings. Kashmir installed 18 internet connected devices in her apartment and Surya built a special router to follow all the activities and see what the devices were “selling”.